It is magnificent to stand in infinite solitude on the seashore, beneath an overcast sky, and to look on an endless waste of water. Part of this feeling is the fact that one has made life’s way there and yet must go back, that one would like to cross over but cannot, that one sees nothing to support life and yet senses the voice of life in the sigh of the waves, the murmur of the air, the passing clouds and the lonely cry of birds. Part of this feeling is a claim made by the heart and a rejection, if I may call it that, on the part of nature. But this is impossible in front of the picture, and what I should have found in the picture itself I found only between myself and the picture, namely a claim my heart made on the picture and the picture’s rejection of me; and so I myself became the monk, and the picture became the dune, but the sea itself, on which I should have looked out with longing — the sea was absent. [There can be nothing sadder or more desolate in the world than this place: the only spark of life in the broad domain of death, the linely centre in the lonely circle. 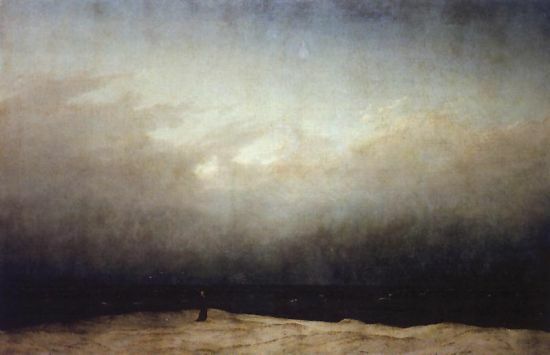 The picture, with its two or three mysterious subjects (monk, dune, sea), lies there like an apocalypse, as if it were thinking Edward Young’s “Night Thoughts” and since it has, in its uniformity and boundlessness, no foreground but the frame, it is as if one’s eyelids had been cut off. Yet the painter has undoubtedly broken an entirely new path in the field of his art, and I am convinced that with his spirit, a square mile of the sand of Mark Brandenburg could be represented with a barberry bush, on which a lone crow might sit preening itself, and that such a picture would have an effect that rivalled Ossian or Kosegarten. Why, if the artist painted this landscape using its own chalk and its own water, I believe he would make the foxes and wolves weep: the most powerful praise, without doubt, that could be given to this kind of landscape painting. Yet my own impressions of this wonderful painting are too confused, and so, before I venture to express them in full, I have decided to learn what I can from the remarks of the couples who pass before it from morning till evening.] I listened to the remarks of the many viewers around me and now relay them as comments on this painting, which is surely a stage set before which a scene must be acted, for it allows no repose. (Enter a Lady [the wife of a senior official in the War Department] and a Gentleman [perhaps a great wit]). LADY (looks in her catalogue): Painting Number Two: a landscape in oils. What do you think of it? GENTLEMAN: Infinitely deep and sublime! LADY: You mean the sea, yes, it must be amazingly deep, and the monk is also very sublime. GENTLEMAN: No, Frau Kriegsrat, I mean the emotion felt by the one and only Friedrich before this painting. LADY: Is it old enough for him to have seen it too? FIRST LADY: Did you hear that, Louise? It’s Ossian. SECOND LADY: No, surely you misunderstand. It’s the ocean. FIRST LADY: But he said he was striking his harp. SECOND LADY: Well, I don’t see any harp. It’s really gruesome. FIRST CONNOISSEUR: Greysome, yes, it is all terribly grey. how he insists on painting such dry stuff. SECOND CONNOISSEUR: You mean, how he insists on painting such wet stuff so dryly. FIRST CONNOISSEUR: I suppose he paints it as well as he can. GOVERNESS: This is the sea near Rügen. FIRST YOUNG LADY: Where Kosegarten lives. SECOND YOUNG LADY: Where groceries come from. GOVERNESS: Why did he paint nothing but dull skies? How lovely it would be if he had painteed some men gathering amber on the seashore. FIRST YOUNG LADY: Oh yes, I’d like to fish for a nice amber necklace for myself. GENTLEMAN: Magnificent, magnificent! This is the only artist who expresses a soul in his landscapes. There is a great individuality in this picture, high truth, solitude, the overcast, melancholy sky — he knows what he’s painting all right. SECOND GENTLEMAN: And he also paints what he knows, and feels it, and thinks it, and paints it. FIRST CHILD: What is that? FIRST GENTLEMAN: That is the sea, my boy, and a monk who is taking a walk along the shore and feeling sad because he hasn’t got a good little boy like you. SECOND CHILD: Why isn’t he dancing at the front of the picture? Why doesn’t he waggle his head like in a shadow-play? That would be more fun! FIRST CHILD: I suppose he predicts the weather, like the monk outside our window. SECOND GENTLEMAN: That’s a different kind of monk, my boy, but he does predict the weather, he is the one within the wholeness, the lonely centre in the lonely circle. FIRST GENTLEMAN: Yes, he is the soul, the heart, the whole picture’s reflection in itself and on itself. 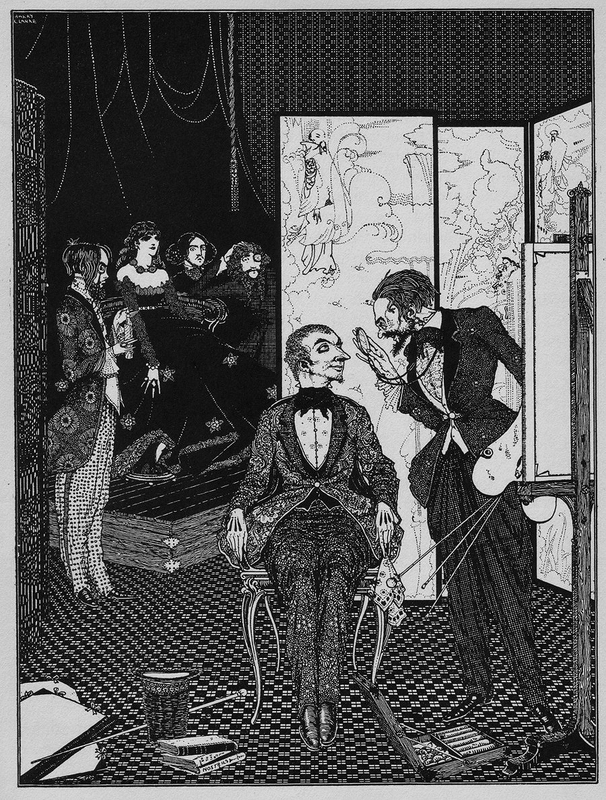 SECOND GENTLEMAN: How divinely the figure is chosen, it is not merely a device to show the height of the other objects, as in the work of the common run of painters. He is the subject itself, he is the picture; and as he seems to dream himself into this setting, as if into a sad mirror of his isolation, so the shipless, enclosing sea, which binds him like a vow, and the bleak, sandy shore, as friendless as his life, seem symbolically to make him spring up again like a lonely dune plant prophesying its own fate. FIRST GENTLEMAN: Magnificent, certainly, you are right. (To the Lady) But, my dear, you have not said a word. LADY: Oh, I felt so at home in front of the picture, it truly touched me. It is truly lifelike, and when you were talking like that, it was all hazy, just like when I went for a walk beside the sea with our philosophical friends. I only wish that a fresh sea breeze was blowing and a sail was coming in, and that there was a glint of sunlight and the water was lapping. As it is, it’s like a dream, having a nightmare or feeling homesick — let’s move on, it’s making me feel sad. LADY (stands for a long time before speaking): How grand, how immeasurably grand! It is as if the sea was thinking Edward Young’s “Night Thoughts”. GENTLEMAN: You mean, as if they had occurred to the monk here? LADY: If only you wouldn’t make jokes all the time, and spoil the impression. Secretly you feel the same but you want to mock in others what you yourself reverence. What I said was, it is as if the sea was thinking Young’s “Night Thoughts”. GENTLEMAN: Yes, I agree, particularly the Karlsruke second edition, and Mercier’s “Bonnet de nuit” as well, and then Schubert’s “View of Nature from its Dark Side” on top of that. GENTLEMAN: Surely not as prettily as you when you say that. LADY: You are beginning to annoy me. GENTLEMAN: And Gottsched gave his wife a kiss for her bon mot. LADY: I could give you a “bonnet de nuit” for yours, but a wet blanket would be more appropriate. GENTLEMAN: Surely I am more like a view of your nature from its dark side. GENTLEMAN: Ah, if only we were both standing there, like the monk! LADY: I would leave you and go to the monk. GENTLEMAN: And ask him to make us one. LADY: No, to throw you in the water. GENTLEMAN: And then you would be alone with the holy man, and you would seduce him, and spoil the whole picture and his night thoughts; you see, that’s what you women are like, in the end you destroy what you feel, in your very lying you tell the truth. How I wish I was the monk, forever gazing out alone over the dark, foreboding sea which spreads out before him like the apocalypse. I would forever yearn for you, dear Julia, yet would be without you forever, for longing is the only magnificent feeling in love. LADY: no, no, my dear, it is true in this picture too; if you talk like that, I will jump in the water after you and leave the monk by himself. THE CHATEAU into which my valet had ventured to make forcible entrance, rather than permit me, in my desperately wounded condition, to pass a night in the open air, was one of those piles of commingled gloom and grandeur which have so long frowned among the Appennines, not less in fact than in the fancy of Mrs. Radcliffe. To all appearance it had been temporarily and very lately abandoned. We established ourselves in one of the smallest and least sumptuously furnished apartments. It lay in a remote turret of the building. Its decorations were rich, yet tattered and antique. Its walls were hung with tapestry and bedecked with manifold and multiform armorial trophies, together with an unusually great number of very spirited modern paintings in frames of rich golden arabesque. In these paintings, which depended from the walls not only in their main surfaces, but in very many nooks which the bizarre architecture of the chateau rendered necessary-in these paintings my incipient delirium, perhaps, had caused me to take deep interest; so that I bade Pedro to close the heavy shutters of the room-since it was already night-to light the tongues of a tall candelabrum which stood by the head of my bed-and to throw open far and wide the fringed curtains of black velvet which enveloped the bed itself. I wished all this done that I might resign myself, if not to sleep, at least alternately to the contemplation of these pictures, and the perusal of a small volume which had been found upon the pillow, and which purported to criticise and describe them. Long-long I read-and devoutly, devotedly I gazed. Rapidly and gloriously the hours flew by and the deep midnight came. The position of the candelabrum displeased me, and outreaching my hand with difficulty, rather than disturb my slumbering valet, I placed it so as to throw its rays more fully upon the book. But the action produced an effect altogether unanticipated. The rays of the numerous candles (for there were many) now fell within a niche of the room which had hitherto been thrown into deep shade by one of the bed-posts. I thus saw in vivid light a picture all unnoticed before. It was the portrait of a young girl just ripening into womanhood. I glanced at the painting hurriedly, and then closed my eyes. Why I did this was not at first apparent even to my own perception. But while my lids remained thus shut, I ran over in my mind my reason for so shutting them. It was an impulsive movement to gain time for thought-to make sure that my vision had not deceived me-to calm and subdue my fancy for a more sober and more certain gaze. In a very few moments I again looked fixedly at the painting. “She was a maiden of rarest beauty, and not more lovely than full of glee. And evil was the hour when she saw, and loved, and wedded the painter. He, passionate, studious, austere, and having already a bride in his Art; she a maiden of rarest beauty, and not more lovely than full of glee; all light and smiles, and frolicsome as the young fawn; loving and cherishing all things; hating only the Art which was her rival; dreading only the pallet and brushes and other untoward instruments which deprived her of the countenance of her lover. It was thus a terrible thing for this lady to hear the painter speak of his desire to portray even his young bride. But she was humble and obedient, and sat meekly for many weeks in the dark, high turret-chamber where the light dripped upon the pale canvas only from overhead. But he, the painter, took glory in his work, which went on from hour to hour, and from day to day. And be was a passionate, and wild, and moody man, who became lost in reveries; so that he would not see that the light which fell so ghastly in that lone turret withered the health and the spirits of his bride, who pined visibly to all but him. Yet she smiled on and still on, uncomplainingly, because she saw that the painter (who had high renown) took a fervid and burning pleasure in his task, and wrought day and night to depict her who so loved him, yet who grew daily more dispirited and weak. And in sooth some who beheld the portrait spoke of its resemblance in low words, as of a mighty marvel, and a proof not less of the power of the painter than of his deep love for her whom he depicted so surpassingly well. But at length, as the labor drew nearer to its conclusion, there were admitted none into the turret; for the painter had grown wild with the ardor of his work, and turned his eyes from canvas merely, even to regard the countenance of his wife. And he would not see that the tints which he spread upon the canvas were drawn from the cheeks of her who sate beside him. And when many weeks bad passed, and but little remained to do, save one brush upon the mouth and one tint upon the eye, the spirit of the lady again flickered up as the flame within the socket of the lamp. And then the brush was given, and then the tint was placed; and, for one moment, the painter stood entranced before the work which he had wrought; but in the next, while he yet gazed, he grew tremulous and very pallid, and aghast, and crying with a loud voice, ‘This is indeed Life itself!’ turned suddenly to regard his beloved:- She was dead! 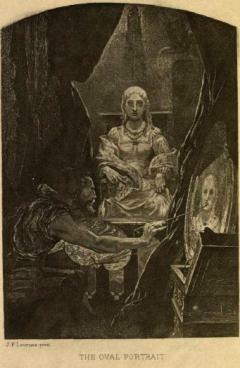 I shall ever bear about me a memory of the many solemn hours I thus spent alone with the master of the House of Usher. Yet I should fail in any attempt to convey an idea of the exact character of the studies, or of the occupations, in which he involved me, or led me the way. An excited and highly distempered ideality threw a sulphureous lustre over all. His long improvised dirges will ring forever in my ears. Among other things, I hold painfully in mind a certain singular perversion and amplification of the wild air of the last waltz of Von Weber. From the paintings over which his elaborate fancy brooded, and which grew, touch by touch, into vaguenesses at which I shuddered the more thrillingly, because I shuddered knowing not why; –from these paintings (vivid as their images now are before me) I would in vain endeavour to deduce more than a small portion which should lie within the compass of merely written words. By the utter simplicity, by the nakedness of his designs, he arrested and overawed attention. 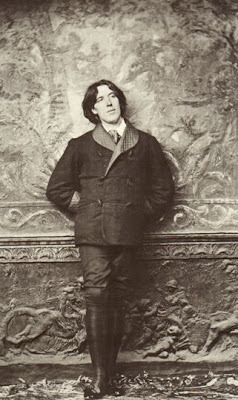 If ever mortal painted an idea, that mortal was Roderick Usher. For me at least — in the circumstances then surrounding me — there arose out of the pure abstractions which the hypochondriac contrived to throw upon his canvas, an intensity of intolerable awe, no shadow of which felt I ever yet in the contemplation of the certainly glowing yet too concrete reveries of Fuseli. Image: Harry Clarke, 1889-1931. EA Poe. Tales of Mystery and Imagination, 1923.